The safari lodge is secretly hidden up a kloof in the indigenous Valley Bushveld. This intimate thatched lodge and its unique safari huts offer all of the creature comforts of a modern safari lodge. 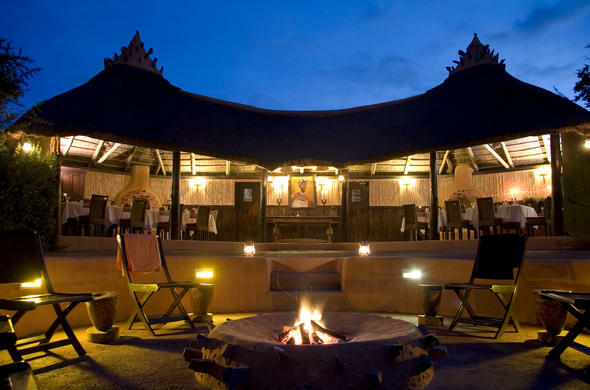 Feel the heartbeat and rhythm of Africa at The Safari Lodge in the breathtaking Eastern Cape Wilderness. Only 40 minutes east of Port Elizabeth in the Greater Addo area you will find The Safari Lodge, situated in the Amakhala Game Reserve. A game drive through Amakhala Game Reserve will leave you in awe of the diverse vegetation and spectacular scenery which abounds here. Sunlit grassy savannah plains, a mosaic of Valley Bushveld plants, the gently dappled light of the sand forest, many watering holes and the wide spellbinding Bushman's River. This is home to great African mammals, birds and insects. It will humble and fascinate you. The Safari Lodge is secretly hidden up a kloof in the indigenous Valley Bushveld. African tribal design has inspired the creation of this intimate thatched safari lodge and its unique safari huts, which offer all of the creature comforts of a graded four star safari lodge. Guests staying at this Eastern Cape accommodation can soak in a luxurious double bath or splash off the dust in an outdoor shower before sharing your day's adventures around the fireside under a canopy of stars. Children under the age of 6 years may not join the adult's game drive. The children will have their own activities and programme designed especially for their age group. Where possible special arrangements will be made to suit the families on game drives. On arrival the children will receive a Kiddies welcome pack which will include:- colouring fun: crayons, sweeties, and lots of exciting goodies inside. There are child minders to look after babies while the adults are on their game activities and meal times.